Story: During a family vacation, Mrs McRoberts saw "a cloud over a mountaintop, suggestive of a smoking volcano" and snapped a photo of it. She didn't notice the UFO at the time the photo was taken, it was captured by chance. More case details at ufobc, ufoevidence. Higher-resolution versions of the photo: full uncropped, magnified cropout). APRO, Dr.Harder and Dr.Haines (a retired NASA scientist, who in 2000 established NARCAP - compiled a database of over 3000 UFO sightings by pilots - see documentary "Pilot UFO sightings") took an interest in the photo. 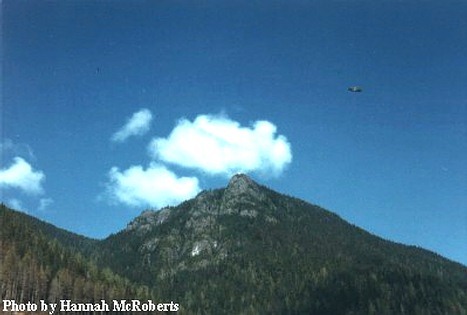 An analysis of the Kelsey Bay UFO photo (.PDF) is published in the scientific report of the Sturrock Panel 1997 (.PDF), funded by billionaire Laurance Rockefeller. Dr.Haines considered the possibility that it was just a small frisbee near the camera, and argued that a frisbee wouldn't fly well if it had a dome on its top -as the Vancouver object apparently has- nor would it show up sharp in the photo due to its quick movement. Related: This domed disk resembles the object in the William Herrmann, Charleston USA, Apr-1980 UFO photos and possibly the Prince George, Canada Jun-1998 UFO photos. Also the case Pilot's Car Engine Suddenly Stops; Spots 4 UFOs (Discs) Nov-1957 AISS (FOIA). Below: Artist's depiction of another similar case near Cowichan Hospital, again in Vancouver Island BC Canada on New Year's Eve 1-Jan-1970. Case details: ufoevidence, ufobc. The recently declassified Canadian UFO files include the statements of the witnesses to the police. The witness was sitting on the passenger's seat, taking landscape photographs under the rain when suddenly a luminous disk appeared. The photograph is from the UFO files of the French Gendarmerie Nationale. Todo: Add here the video interview of Russian Colonel Vyatkin Lev Mikhailovic (HistoryChannel "Russian Roswell" 34'48"), who describes an encounter with a disk-shaped UFO on 7-Aug-1967. His plane "shook" as its wing was hit by a "ray of light" emanating from the underside of the UFO above him. Summary: This page aims to offer a fairly broad selection of decent UFO documentaries. One of the problems that confronts anyone who wants to seriously study the UFO phenomenon is learning which books and documentaries on the subject can be trusted, and which books and documentaries are done by blindly partisan advocates (either "true believers" or "debunkers") or mainly for entertainment (some of the latest generation of fast paced, but low on content, info-tainment type productions). Keep in mind however that most UFO documentaries are meant to appeal to the broadest possible audience, and as such are quite basic, i.e. "UFOs 101". Animated graphics were used to re-enact sighting accounts. Watch the first 8 minutes of CBS TV's 1966 Special "UFOs: Friend, Foe or Fantasy? ", presented by America's top newsman Walter Cronkite ("the most trusted man in America" to deliver the news), which deals with the famous Michigan 1966 wave of UFO sightings. The multiple sightings by responsible citizens prompted then House Minority Leader Gerald R. Ford, R-Mich. (and later US President) to call for Congressional hearings on the subject (more @ presidentialufo). You can watch the entire CBS 1966 UFO documentary at CBS video archive. Sponsored by no less than IBM, it featured many high profile scientists of the era, incl. astronomers Drs Hynek, Menzel, Page, Carl Sagan, military spokespersons and others. Media spin: Like many other UFO presentations on television, the CBS 1966 UFO special was primarily another attempt to dismiss UFOs. It was criticized for "bait and switch" techniques, as well as inaccurate and misleading presentations. It "left the unmistakable implication... that those who report UFOs are either unreliable or mentally unbalanced", writes Terry Hansen in his 2001 book "The Missing Times: News Media Complicity in the UFO Cover-up" (amazon) Perhaps the most unambiguous evidence of the agenda behind the 1966 CBS broadcast, is a personal letter by astronomer Dr. Thornton Page (who appears together with Carl Sagan), discovered in the Smithsonian archives by biochemist Dr. Michael D. Swords. The 1966 letter, addressed to former Robertson Panel Secretary Frederick C. Durant, confides that Page "helped organize the CBS TV show around the Robertson Panel conclusions". For those who don't know the background, the Robertson Panel was commissioned by the CIA in 1952 to look into UFOs and among others recommended that the mass media be used for UFO "debunking" via a public relations campaign, using psychologists familiar with mass psychology, astronomers and assorted celebrities to significantly reduce public interest in UFOs. Page's letter indicates that it was still putting a negative spin on UFO news at least 13 years after the panel met. Fun facts: In an attempt to explain the Hillsdale MI 1966 sighting, astronomer Dr J.Allen Hynek (in USAF's Project BlueBook payroll at the time) came up with the infamous "swamp gas" explanation, which remains to this day a national joke in USA. The memorable quotes of the 1997 comedy movie "Men in black", include "The flash of light you saw in the sky was not a UFO. Swamp gas from a weather balloon was trapped in a thermal pocket and reflected the light from Venus." mocking some of the official explanations offered to explain away puzzling UFO sightings: balloons, temperature inversions, marsh gas. Other funny hard-to-believe ideas have included 'pelicans' (see Skeptics, pelicanists and Prozac explanations) and even 'female flying dolphins' (believe it or not). Jokes aside, the debunking of the Portage County 17-Apr-1966 case (when Ohio cops chased a UFO for over an hour, into Pennsylvania) as the planet Venus by Maj. Hector Quintanilla (head of USAF's project Blue Book at the time), had a devastating effect on the carreers and family lives of the cops involved. The Portage incident was recently re-investigated by archaeologist Michel Nelson. Recent UFO documentaries by independent film-makers who have shown a genuine interest in the UFO enigma and actually know something about the subject. Though perhaps less impressive than big budget primetime mainstream television features on UFOs, the methodology, knowledge and intellectual honesty make these documentaries stand out above many bigger budget efforts. 2007 the 5-Year Anniversary Edition of "OUT OF THE BLUE: The definitive investigation of the UFO phenomenon" by US producer James Fox. Canadian film-maker Michael R. MacDonald "Shag Harbour 1967"
The storyline is James Fox's personal journey for the truth. It revolves around the cases and testimonies presented at the highly acclaimed "UFO Close Encounters" press conference held at National Press Club Washington DC in Nov-2007 (note: you can watch the full 95 minutes long video of that event at our "testimonies" page). It also includes the Stephenville TX 2008 incidents, which enjoyed wide publicity in the US. First aired on HistoryChannel in Oct-2009. Watch on-line: youtube. [Note: By mid-2009 J.Fox had basically ran out of money and had to complete it ASAP, so it does have some rough edges]. 2011 "Secret Access: UFOs On The Record" is based on Leslie Kean's NYT bestseller "UFOs: Generals, Pilots and Government Officials Go On The Record", which forms the basis of the History Channel special. Latest doesn't equal greatest: Many people arrive at this webpage searching via Google/Yahoo/Bing for the "latest UFO documentary" probably assuming that the most recent ones should offer the best current understanding of the UFO phenomenon. However, since I have watched practically every UFO documentary produced since the 1950s, I'd like to point out that some of the more substantive UFO documentaries were produced in previous decades. One reason may be that in recent years, many UFO researchers have simply declined participating in UFO presentations on television, viewing them as (quote) "generally moronic and exploitative". Select UFO video documentaries and witness testimonies (simply click the links to watch; Hint: for long-duration videos, keep in mind that you can click on the "progress bar" to skip and access any parts of a video). Out Of The Blue: The definitive investigation of the UFO phenomenon (2002, 2007) 90min. Watch (old 2002 edition) online GoogleVideo (1hr30min 353MB) or buy from amazon. One of the few documentaries which stresses the global character of the UFO phenomenon, by presenting UFO incidents from USA (Phoenix Lights 1997, Big Sur filming Vandenberg AFB 1964), Russia, Britain, France, Iran etc. Features interviews with former astronauts (Gordon Cooper and Dr Edgar Mitchell), military pilots, radar operators, scientists. Discusses UFO initiatives by former US presidents Carter, Ford and Clinton. Studies like the French COMETA Report. While it has some flaws, such as the inclusion of Col. Corso and references MJ12 lore, it is a decent introduction to the UFO subject. This documentary takes a "pro-UFO" constructive approach. Querying scientists about feasibility of interstellar travel, the probability of ET life in the universe, it examines the argument that some UFOs are alien craft, though it avoids stating that outright. Context: By the 1970s, astronomers Drs Vallee and Hynek (who had worked closely together for some time) were leaning away from the ETH (Extra Terrestrial Hypothesis) of UFOs being "nuts and bolts" craft, to the even more exotic "interdimensional" / "paranormal" ideas about the UFO phenomenon. This documentary includes some rather fanciful stories (telepathic "channelling", "automatic writing" and memories recovered under hypnosis of abduction and contact with a benevolent blonde human-looking "Nordic"-type robed UFO occupant). The strongest points of this documentary are its comprehensive coverage of the 1973 Coyne helicopter incident and the sinister "animal mutilation and exsanguination" phenomenon (which was actually at a peak in the mid-1970s). Also interesting are Col. Coleman's presentation of USAF's early (1947-1952) look into the UFO problem, as well as a panel discussion with astronomer Dr Hynek (scientific consultant to USAF Project Bluebook for 20 years) and USAF Colonels Robert J. Friend and Hector Quintanilla (who both served as heads of Bluebook from the mid-1950s until its closure in 1969). Pilot UFO sightings (44min) (amazon, googlevideo, youtube) Examines several pilot-UFO cases, both classic and less known ones. It is presented by retired NASA scientist Dr.R.Haines, who has been researching UFO sightings by pilots for 30 years and in 2000 established NARCAP. Its weakness is the (by today's standards) not-so-spectacular special effects / artist re-creations of the cases. You'll need some background in the UFO subject to appreciate this video, I think some people will find parts of it boring. If so, you can skip to 34'15" to 36'10" to hear Dr.Haines summarize. ABC's Special - "Peter Jennings Reporting - UFOs: Seeing is believing" Feb-2005 (90min). Available from amazon. Watch online Youtube video extracts from Peter Jennings' UFO Special: part1, part2, part3. The first half of the show features several compelling UFO cases (e.g. Phoenix AZ 1997, Minot AFB 1968, Illinois 2000) with accurate CGI recreations, interviews with eyewitnesses incl. military pilots and cops. It also notes USAF Blue Book's policy of explaining away UFO sightings. The second half of the show devotes a significant portion to UFO skeptics, who categorically reject any and all eyewitness testimony, talk about the difficulties of interstellar travel and look for signs of ETI with radio-telescopes (SETI). Back to UFOs, the lore around the Roswell incident of Jul-1947 (alleged UFO crash) is dismissed as "myth with no credible witnesses" and UFO researchers involved with the Roswell case are smeared as "promoters" who are into it just for the money. Finally it deals with the "UFO/alien abduction" phenomenon which is attributed to sleep disorders. Perhaps not suprisingly, Jennings was criticized by both UFO proponents and skeptics: reviews, Friedman, Greer, Dolan and Haisch on ABC's UFO Special (.PDF). Others were more positive, e.g. Twitchell and J.Clark. "Where Are All the UFOs?" (1996) 120min amazon. A documentary on the "myth" of UFOs and phenomena such as alien abductions, crop circles. If you're interested in the social history of the UFO phenomenon, it does spend time on the "lunatic fringe" of the UFO subculture, such as the 1950s "contactees" (people who claimed to be in contact with benevolent "space brothers" and go on trips to remote worlds). "UFOs - und es gibt sie doch!" (1994) [in German language] by Heinz Rohde. "Investigation: Ovnis Quand l armee_enquete" youtube by Canal+ [in French language]. "Britain's Closest Encounters" (2008): Episode 1, Episode 2, Episode 3. Originally aired on Channel 5 Television (UK). A parade of british UFO skeptics. "British UFO Files" (GoogleVideo 47min 356MB), a so-so documentary. If you can overcome the hurdle of the sensationalistic spooky music and narration in the beginning, it offers several interesting bits of info lateron, e.g. 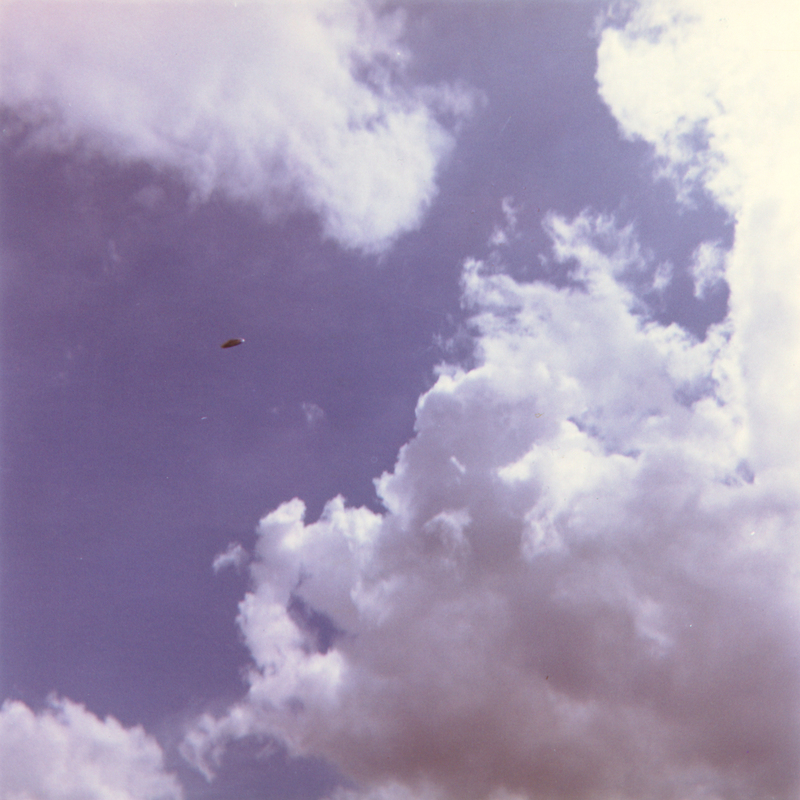 a 1952 sighting when 2 British pilots (RAF pilot Michael Swiney and his Royal Navy student David Crofts who saw 3 flying saucers in formation with ground radar confirmation, on the 15'-21'). Physical landing trace case in 1952 with round scorch-marks left in the ground. Interest expressed by the Duke of Edinburgh and Earl Mountbatten was covered. And ofcourse the classic Bentwaters-Rendlesham case of 1980. "I saw footage of three disc-shaped craft. One of the craft landed and two of them went away. It appeared to be in trouble because it oscillated all the way down to the ground. However, it did land on three pods. A sliding door opened, a ramp was extended, and out came three aliens. They were human size. They had odd gray complexions and a pronounced nose. They wore tight-fitting jump suits, thin headdresses that appeared to be communications devices, and in their hands they held a translator, I was told. The Holloman base commander and other Air Force officers went out to meet them." There was a segment dealing with the Gulf Breeze, Florida 1987 wave of sightings (incl the controversial Ed Walters photos). Among many other guests, William Moore and Jamie Shandera discuss the "Majestic 12" documents, and introduced their sources "Falcon" and "Condor", allegedly high-level government intelligence officials. Interviewed in shadow and with masked voices, Falcon and Condor disclosed information about the U.S. government's involvement in UFOs and alien interaction, UFO crashes and occupant retrievals, and alien biology. Classic 1956 movie "U.F.O.". Clips include several important interviews: Nick Mariana UFO Footage - Great Falls, Montana 1950, Delbert Newhouse UFO Footage - Tremonton, Utah 1952. Blog ufothemovie.blogspot.com by Robert Barrow. NBC's "Unsolved Mysteries: UFOs" Vol 1-4 4xDVDs (Amazon or get from ED2K P2P). Other than the fact of spooky "Twilight Zone"-type background and that a couple of all the cases have later been discounted, it's quite decent. Covers UFO sightings (Belgian UFO flap 1989-1990, Phoenix Lights 1997 etc), alien abduction cases (Allagash, Travis Walton), crop circles etc. Features UFO segments, complete with re-creations of each incident by actors, many interviews with the witnesses and UFO researchers and occasional interviews with UFO skeptics. Overall a nicely put together and professionaly produced collection. "It Came From Heaven" Giant UFO in Yukon Territory, Canada Dec-1996 (2006) - googlevideo. In December of 1996 approximately 30 people claimed to have witnessed a giant UFO along a 340 km stretch of highway in Yukon. The case is presented by UFO researcher Martin Jasek, who investigated the reports. This documentary features several witnesses discussing their experiences on that evening. It also discusses the aboriginal historical perspective on the UFO phenomenon in Yukon with a local Elder. More about this case: ufobc. The very interesting case of an "acorn"-shaped (egg-shaped, with an annular band around the bottom) UFO crashing in Kecksburg, Pennsylvania USA on 9-Dec-1965, has been drawing some attention in recent years. Considerable work has been done by UFO researcher Stan Gordon. In late 2007, NASA agreed to search for records after being ordered by a court, after a lawsuit by "Coalition for Freedom of Info" organization. Larry P. Warren UFO Connection - The Woobridge / Rendlesham forest UFO Incident - Bentwaters. At the age of 19, he was member of the US Air Force Security Police stationed at the base in 1980 and a first-hand witness of the incident. Others witnesses of the case have speculated that Larry had been given Sodium Pentothal and "worked on" by the OSI (Office of Special Investigations). Second part of "Secret NASA transmissions - The smoking gun" featuring footage by Martin Stubbs (a former cable TV station manager from Vancouver in Canada who, over a period of 5 years, used his station's satellite array to record on videotape over 2,500 hours of Space Shuttle transmissions via NASA's downlink. Since 11-Mar-2000, when some of Martin's footage was released in public, there has been considerable debate as to the origin and makeup of the phenomena seen in the footage.) You can watch the complete 1hr30min version of "Secret NASA transmissions - The smoking gun". Compilation of UFO Video Footage and Testimony GoogleVideo (1hr 35min 329MB). Privately-(home)-produced. No speaking at all, just 60 minutes of raw UFO footage (from a selection of over 200 clips) and 35 minutes of witness testimony. With 80's music in the background. Same in more (2hr28min) of the same (but first one is better). The Disclosure Project Witness Testimony (2001) Googlevideo (2hrs), part 1 of 2 (59min 230MB) and part 2 of 2 (1hr 240MB). Two hours long video distillation from 400hrs of raw video footage of dozens of retired USA intelligence, government and military persons testimonies on the subject of UFO and US government coverup. Quick text summary (.html) sample of such testimonies given in 1999-2000. Note: There were mixed responses from the UFO research community towards Dr. Greer's Disclosure Project. The main points of criticism were against Dr Greer himself and to a lesser degree, against a few of the Project's witnesses whose stories are impossible to verify. History Channel has produced many broadcasts on UFOs, such as the series "UFO Files" and recently the "UFO Hunters" (which has been criticized by UFO researchers for being superficial). Evidently HC has an extensive library of UFO-related video footage and witness testimonies, which they mix-and-match as needed. Quality varies greatly, some episodes are pretty solid, other episodes are a waste of time. The "UFO Files" series consisted of about 50 episodes (torrent). The "UFO Hunters" series was produced for 3 seasons (until the 2008/2009 season). Discovery Channel series: "World's strangest UFO stories"
"Fastwalkers - Ufo and Alien Disclosure 2006" (src: youtube) Dec-2006 1hr37min. Documentary consisting entirely of interviews with UFO researchers, whistle-blowers, witnesses, "experiencers" / "contactees" etc. Some testimonies have an "esoteric" / "spiritualistic" bend, some are interesting, but several ones questionable and with inaccuracies (e.g. a testimony claiming $1.7trillion/yr US black-budget?! a more realistic estimate would be $25-50bn/yr) and a lot of pretty "far out stuff" which I don't know what to make of... Other sources: buy DVD, or torrent. Retired USAF LtCol Wendelle Stevens (Foreign Technology Command of Air Materiel Command), who reportedly was involved in a UFO monitoring project in the Arctic in 1946-1949. By exchanging UFO pictures, he has compiled the largest library of UFO images, over 4000 pictures (how many authentic?). A controversial figure in UFO field, who has embraced the Billy Meier (Switzerland) "contactee" case, which most UFO researchers consider a hoax. He has also privately published books with several other "contactee" stories. Interviews: 1999, older video interview (7min, 18MB) Video is very poor quality. Talks about USAF monitoring operations of UFOs over the Arctic in 1947-1949 using B-29s specially equipped with photo and video equipment, as well as radiation detectors, magnetic detectors, and RF emission scanners. Earlier video interview by the same. "UFO The Greatest Story Ever Denied" (1hr34min) or buy DVD from official website. A lot of duplication as it includes in verbatim many testimonies from DisclosureProject (see above), but also some unique/interesting bits and pieces. XCon 2005 - Seen From Above Military and Airline Pilot's Experiences with UFOs. Commander Graham Bethune, David Coote, Jim Courant, Don Daniels and Robert Durant. "I often read here of people's great disappointment after a UFO documentary is aired - and their often justifiable sense that they, as vitally interested explorers in the realm, and also the participants featured in the show, were somehow duped. As a producer/director of 30 documentaries, most broadcast on PBS and cable networks, I wouldn't disagree with those feelings most of the time. The shows that have aired over the past decade are usually banal and simplified, reworking cases mined to death, and, by the end of an hour or two hours, the producers simply haven't done more than touch the tip of the submerged mystery. And that's a description of the 'good ones'!" Therefore, if you are really interested in learning more about the UFO phenomenon, you should read in-depth material such as my UFO Quick Technical Overview: what we think we know about UFOs or the books in the docs and research sites in resources pages.